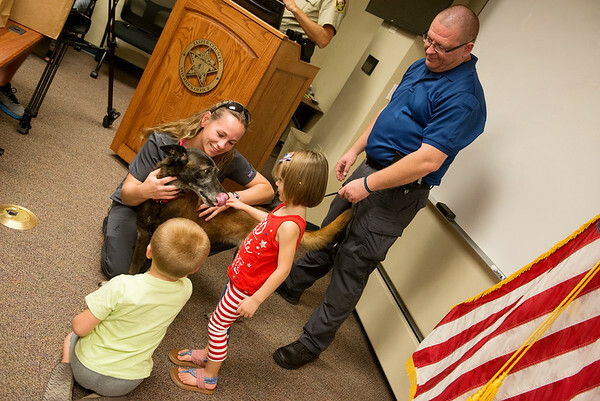 Pam Helm, veterinarian at Main Street Pet Car, Charlotee Todd, 4, and Tyler Talkington, 4, congratulate Jasper County Sheriff K-9 Lyssa on her retirement on Friday. Also pictured is Lyssa's handler Cpl. Matt Smith, who said Lyssa has tracked about 60 suspects and 30 missing children over her eight-year career. Main Street Pet Care also presented the department and the Joplin Police Department with K-9 cooling vests for their dogs.